There are several sorts of acoustic (ie non-electric) guitar. My speciality is Classical Guitar. The Classical Guitar has plain and wire-coated nylon strings, instead of the steel strings of a Folk Guitar. The sound is mellow and the strings are easy to press - we don't get sore fingers! We sound the Classical Guitar with thumb & fingers rather than a pick - we feel the strings and select just the ones we want, rather than having to finger them all. Classical Technique lets us play Fingerstyle Folk, Ragtime, Electric Bass and Spanish Guitar too! If you can't read music, I'll teach you - it's surprisingly easy & logical, and I have tricks to help you learn! If you don't have a suitable guitar, I can recommend proven models to suit all pockets. The video showcases a piece that you'll soon be playing if you join me as a complete beginner! 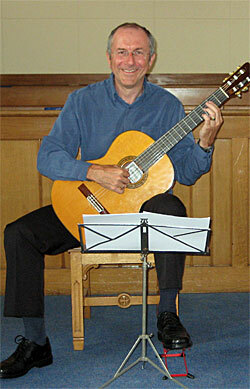 The Classical Guitar sounds great playing music from centuries ago, but it's equally at ease with modern music. Hear some examples on my Videos & MP3s page. The Hampshire Guitar Orchestra, which I directed, has repertoire from Handel to Elton John, from Dvorak to Katie Melua - see and hear HAGO on their YouTube channel.